Our instruments are designed to encourage new musicians of all ages. inspire and support continued musical growth. Kohala Tiki ukuleles are available in a variety of colors. and metal geared tuners for tuning accuracy. rugged and accurate chrome geared tuners. The Kohala Kine’o series ukuleles are a perfect first ukulele. They are made from durable Linden wood and topped off with geared tuners for accurate tuning and durability. The soprano ukulele is the smallest ukulele measuring around 21” with twelve frets. It’s considered the “standard” size. Sopranos have a bright and punchy tone. The concert ukulele is a little longer than the soprano, typically around 23” long, and has a slightly larger body which adds depth and body to the sound. The tenor ukulele is typically around 26” long. It has a few more frets and a larger body than a concert ukulele, adding even more lows and a fuller tone. Baritone ukuleles have a lower register than the other ukuleles in the traditional family. A Baritone plays like a guitar and is tuned like the highest 4 guitar strings D, G, B, and E (low to high). Kohala Akamai ukuleles have a traditional look and tone made from rich Mahogany top, back and sides. The playability is enhanced with accurate chrome geared tuners. The Akamai series includes a limited lifetime warranty. 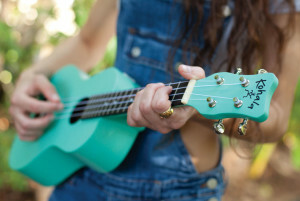 Kohala Tiki ukuleles are available in a wide range of colors to inspire! They are made with all Linden wood construction, include metal geared tuners for tuning accuracy and are adorned with a Tiki style engraved bridge. The Tiki series includes a limited lifetime warranty. Kohala Kine’o ukuleles are an excellent choice for a first ukulele. They are made from durable Linden wood and topped off with geared tuners for easy playability. The Kine’o series includes a limited lifetime warranty. 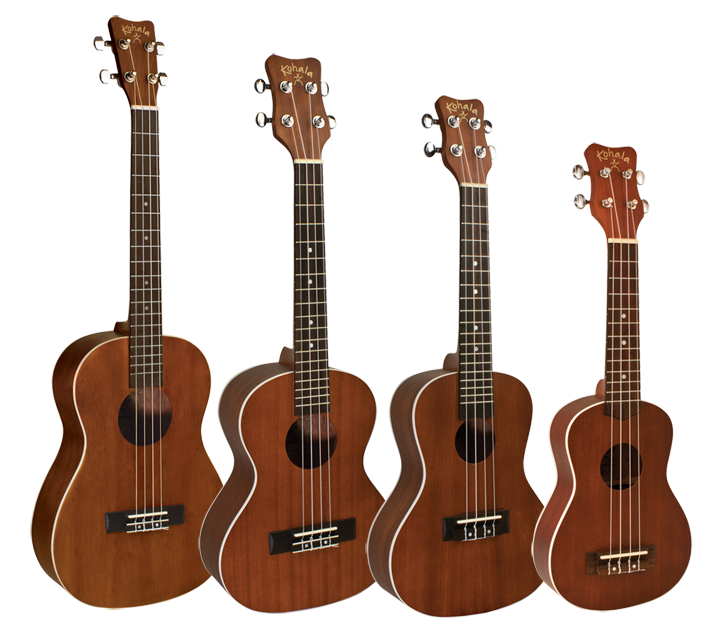 Kohala Player Packs are offered in all 4 ukulele sizes: soprano, concert, tenor and baritone. The Player Packs are perfect for any age to get started on ukulele. Each pack comes complete with a satin finish ukulele with durable chrome open back tuning machines, a 5mm padded gig bag, and a convenient clip on tuner and a limited lifetime warranty. Kohala ukuleles announces a new series of 8 guitars, 4 nylon and 4 steel string, in ½ size, ¾ size, full size and full size acoustic/electric with on-board tuner. Sized to perfectly fit any new player, all of the new Kohala guitars include an adjustable truss rod for maximum playability, properly cured woods and bracing, special fret installation and pressurized gluing methods for enhanced performance. Each Kohala guitar includes a 5mm padded gig bag and a Limited Lifetime Warranty.